Recently, on a machine with custom upstart init scripts, I couldn't figure out why I couldn't access serial ports or USB devices, even though my username was in the dialout and plugdev groups in /etc/group. And looking online, I found various tricks people would use to run the commands they needed using newgrp. (It's not trivial, since newgrp insists on creating a subshell). But I kept getting the sense that newgrp should almost never be necessary anymore, now that modern unix systems have the notion of a groupset. Now that I know to look for it, setuidgid's manpage points out that it "remov[es] all supplementary groups". Which isn't very helpful if, for instance, a process needs to access files from both the "dialout" and "plugdev" groups. The formula a^(n-1) mod n appears in Fermat's Little Theorem, which says that for prime values of n, the result will always be 1, no matter what a you choose. If you get a value other than 1, you know that n is composite. That's neat because it lets us test whether a given n is composite much more quickly than by trying to factor it. We call that the Fermat Primality Test. However, the converse doesn't always hold: sometimes a^(n-1)=1 (mod n) even if n is composite. When that happens for some a and n, we say that a is a false witness for n, since it incorrectly suggests that n might be prime. 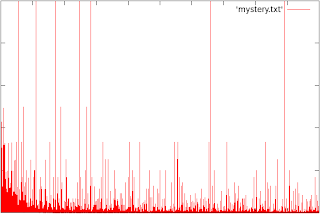 And that's what the above graph shows: how many false witnesses there are for each value n up to 10,000. In particular, I scaled the y axis so that it shows the percentage of relatively prime a values that are false witnesses. Most interesting are the vertical lines in the graph that reach all the way to the top. Those are the falsest of the pseudoprimes (with respect to the Fermat test). They're called the Carmichael Numbers, and I've always found them fascinating, because the smallest of them is 561! That's the leftmost line in the graph that reaches all the way to the top. Just how prime are you? 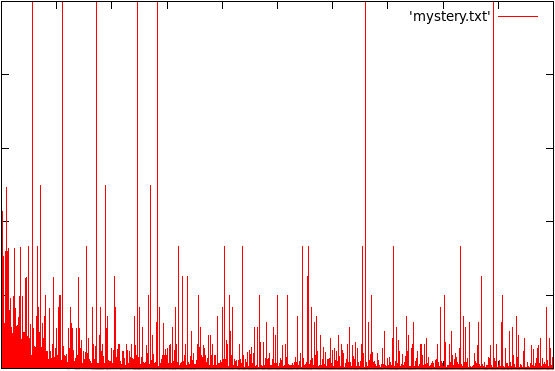 The other thing I was surprised to find in this graph are what we might call the halfway-prime numbers -- numbers for which half of the witnesses will suggest primality with the Fermat test. And there are one-third-prime numbers, and so on. The other trick is that in number theory, we sometimes talk about negative remainders. If you're working (mod 5), you might get remainders of 0,1,2,3,4, but since the next remainder after 4 is 0 again, sometimes it's easier to think of a remainder of 4 as -1. So instead of 0,1,2,3,4, we call them 0,1,2,-2,-1, and that's what I've done here. Consider the topmost orange pixel in the above image. 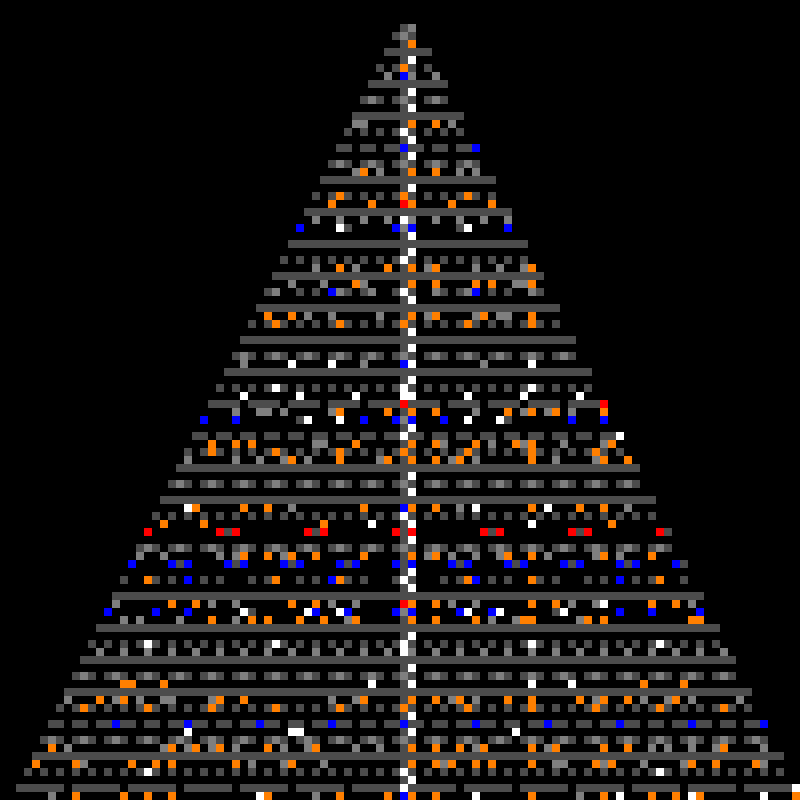 It's the 5th pixel from the top, so that whole row represents n=5. 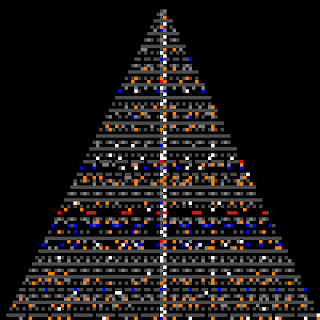 The orange pixel (and all the ones below it) are the "remainder=1" column. The column to the left of it is the "remainder=0" column, and the one to the right is "remainder=2". Since 5 is prime, we expect a^4 to be 1 (mod 5) for all 4 possible values of a: 1,2,3 and 4. And indeed, orange is the color for 4. 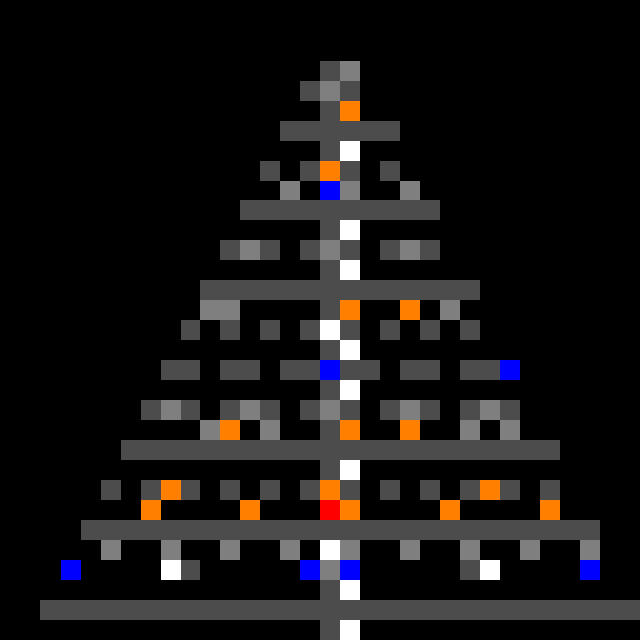 Two pixels down, you'll see a white pixel telling us that 7 is prime, since a^6=1 (mod 7) for a=1,2,3,4,5,6. In the above image, you can keep counting down from the orange pixel at n=5 and see all the primes as white pixels, with 31 at the very bottom. And you can see that lots of other numbers have this behavior: 10, 14, (but not 18! ), 22, 26, 30 and so on. And if you really have a tall living room, you can see the numbers up to 1000, as well as the python source code I used to generate the images.